Background: Patients with psoriasis might be at a higher risk of developing Parkinson's disease (PD) as a result of the detrimental effect of chronic inflammation on the neuronal tissue. This meta-analysis aimed to investigate this risk by comprehensively reviewing all available data. Methods: We conducted a systematic review and meta-analysis of cohort and case–control studies that reported relative risk, hazard ratio, odds ratio, or standardized incidence ratio comparing the risk of PD in patients with psoriasis versus subjects without psoriasis. Pooled risk ratio and 95% confidence interval (CI) were calculated using random-effect, generic inverse variance methods of DerSimonian and Laird. Results: Three retrospective studies and one case–control study met our eligibility criteria and were included in this meta-analysis. The pooled risk ratio of PD in patients with psoriasis versus participants without psoriasis was 1.38 (95% CI, 1.15–1.66). The statistical heterogeneity was low with an I2of 35%. Conclusions: Our meta-analysis demonstrated a statistically significant increased risk of PD among patients with psoriasis. Psoriasis is associated with an increased risk of several co-morbidities, but the data on Parkinson's disease is less clear. In light of chronic inflammation, patients with psoriasis might also be at an increased risk of developing PD. Nevertheless, data on this association are limited. Thus, we conducted a systematic review and meta-analysis of observational studies to investigate if the risk of PD is increased in patients with psoriasis compared with nonpsoriasis participants. Two investigators (Patompong Ungprasert and Narat Srivali) independently searched published articles indexed in MEDLINE and EMBASE database from inception to October 2015 using the search terms that comprised the terms for psoriasis and PD described in Supplementary Data [Additional file 1]. There was no language restriction. References of selected articles were also manually searched. (1) Cohort study or case–control study comparing the risk of PD between subjects with and without psoriasis, (2) relative risk (RR), hazard ratio, incidence ratio (IR), odds ratio (OR) or standardized IR with 95% confidence intervals (CIs) or sufficient raw data to calculate these ratios were provided. Study eligibility was independently determined by the two aforementioned investigators. The senior investigator (Wonngarm Kittanamongkolchai) served as the deciding vote for any different decisions. Newcastle–Ottawa quality assessment scale was used to assess the quality of the included studies. This scale assessed each study in three areas including (1) the recruitment of the subjects (2) the comparability between the two groups and (3) the ascertainment of the outcomes of interest and exposures of interest for cohort study and case–control study, respectively. A standardized data collection form was used to extract the following information:First author's last name, title of the study, year of publication, year of study, country where the study was conducted, study population, method used to identify cases and controls, number of subjects, average duration of follow-up (for cohort study), demographic data of subjects, confounders that were adjusted and adjusted effect estimates with 95% CI. Patompong Ungprasert and Narat Srivali independently performed this data extraction. Any discrepancies were resolved by referring back to the original articles. If the necessary data were not provided in the article, the corresponding author of the article would be contacted. Data analysis was performed using Review Manager 5.3 software from the Cochrane Collaboration (London, United Kingdom). We pooled the point estimates from each study using the generic inverse variance method of DerSimonian and Laird. As the outcome of interest in this study was relatively uncommon, we used OR of case–control study as an estimate for RR to combine this data with RR of cohort study to increase the power and precision of our pooled estimates. We used a random-effect model rather than a fixed-effect model because of the high likelihood of between-study variance due to different populations and study designs. Cochran's Q test, which is complemented with the I2 statistic, was used to assess statistical heterogeneity. This I2 statistic quantifies the proportion of total variation across studies that is due to true heterogeneity rather than chance. A value of I2 of 0–25% represents insignificant heterogeneity, more than 25% but ≤50% low heterogeneity, more than 50% but ≤75% moderate heterogeneity, and more than 75% high heterogeneity. Funnel plot and Egger's linear regression were used for evaluation of publication bias using Comprehensive Meta-Analysis version 2.2 software (Englewood, New Jersey, USA). Our search strategy yielded 202 potentially relevant articles (183 articles from EMBASE and 19 articles from MEDLINE). After exclusion of 18 duplicated articles, 184 articles underwent title and abstract review. One hundred and sixty four articles were excluded at this stage since they were case reports, review articles, correspondences or interventional studies, leaving 20 articles for full-length article review. Sixteen of these articles were excluded after the full-length review as they did not report the exposure or outcome of interest, leaving three retrospective cohort studies and 1 case–control study for the meta-analysis.,,, [Figure 1] outlines the search and literature review process. The clinical characteristics and quality assessment of the included studies are described in [Table 1]. The inter-rater agreement for the quality assessment was high with the kappa statistics of 0.64. All studies did reveal an increased risk of PD among patients with psoriasis even though the increased risk did not always reach statistical significance. The pooled analysis of all studies demonstrated a significantly increased risk of PD in patients with psoriasis with the pooled risk ratio of 1.38 (95% CI, 1.15–1.66). The statistical heterogeneity was low with an I2 of 35%. 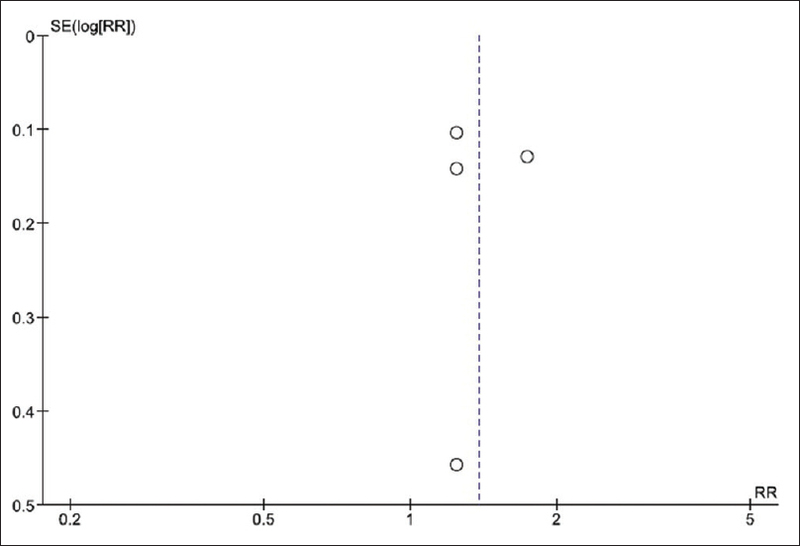 The forest plot of the full analysis is shown in [Figure 2]. To confirm the robustness of our results, we performed jackknife sensitivity analysis by excluding one study at a time from the pooled analysis. The pooled risk ratios from this sensitivity analysis changed slightly, ranging from 1.25 to 1.47 with the lower bounds of the corresponding CIs remained above 1.0. Funnel plot to evaluate publication bias is demonstrated in [Figure 3]. The graph is symmetric and, therefore, is not suggestive of publication bias. Furthermore, there was no evidence of publication bias detected by Egger's regression test (P = 0.72). This meta-analysis is the first study that comprehensively combined all available data on the risk of PD among patients with psoriasis. We were able to demonstrate a significantly elevated risk with 38% excess risk compared with subjects without psoriasis. Why patients with psoriasis have a higher risk of PD remains unclear and therefore, further studies are required. There are few possible explanations. First, this association might be just the result of confounding by obesity as obesity is associated with both psoriasis and PD. High body mass index has been shown to increase the risk of PD in a dose-dependent manner in a recent epidemiologic study  while the relationship between obesity and psoriasis has been recognized for over a decade. A systematic review and meta-analysis of observational studies published between 1980 and 2012 showed the pooled OR for obesity for patients with psoriasis compared with subjects without psoriasis of 1.66. Moreover, the odds for obesity were more prominent in patients with severe psoriasis than those with mild psoriasis. It is hypothesized that the cytokines and bioactive products such as tumor necrosis factor-alpha, interleukin-6, leptin and resistin produced by adipose tissue could predispose patients to psoriasis. More interestingly, frequent use of nonsteroidal anti-inflammatory drugs, particularly ibuprofen, is associated with a lower risk of developing PD which could serve as an indirect evidence to support the role of chronic inflammation in the pathogenesis of this disease. The major strength of this study is the advantage of systemic review and meta-analysis that allows a comprehensive estimation of the risk. The results were robust as demonstrated by the sensitivity analysis. The major limitation is related to the methodology of the primary studies as those studies were conducted using coding-based medical registry which would raise a concern over misclassification and coding incompleteness. Moreover, because of the observational nature of the primary studies, this meta-analysis could only demonstrate an association but could not establish causality. Our meta-analysis demonstrated a significantly increased risk of PD among patients with psoriasis. How this risk should be addressed in clinical practice needs further investigations. Zheng KS, Dorfman BJ, Christos PJ, Khadem NR, Henchcliffe C, Piboolnurak P, et al. Clinical characteristics of exacerbations in Parkinson disease. Neurologist 2012;18:120-4. Pringsheim T, Jette N, Frolkis A, Steeves TD. 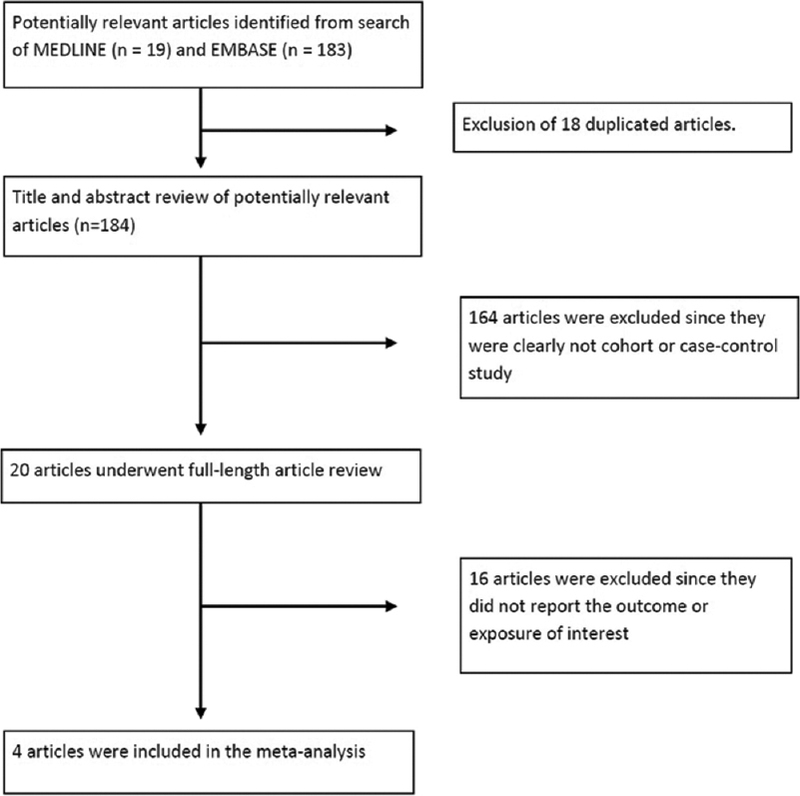 The prevalence of Parkinson's disease: A systematic review and meta-analysis. Mov Disord 2014;29:1583-90. Yan MH, Wang X, Zhu X. Mitochondrial defects and oxidative stress in Alzheimer disease and Parkinson disease. Free Radic Biol Med 2013;62:90-101. Henchcliffe C, Beal MF. Mitochondrial biology and oxidative stress in Parkinson disease pathogenesis. Nat Clin Pract Neurol 2008;4:600-9. Wallin K, Solomon A, Kåreholt I, Tuomilehto J, Soininen H, Kivipelto M. Midlife rheumatoid arthritis increases the risk of cognitive impairment two decades later: A population-based study. J Alzheimers Dis 2012;31:669-76. Lu K, Wang HK, Yeh CC, Huang CY, Sung PS, Wang LC, et al. Association between autoimmune rheumatic diseases and the risk of dementia. Biomed Res Int 2014;2014:861812. Dregan A, Chowienczyk P, Gulliford MC. Are inflammation and related therapy associated with all-cause dementia in a primary care population? J Alzheimers Dis 2015;46:1039-47. Kokpol C, Aekplakorn W, Rajatanavin N. Prevalence and characteristics of metabolic syndrome in South-East Asian psoriatic patients: A case-control study. J Dermatol 2014;41:898-902. Ungprasert P, Sanguankeo A, Upala S, Suksaranjit P. Psoriasis and risk of venous thromboembolism: A systematic review and meta-analysis. QJM 2014;107:793-7. Ungprasert P, Srivali N, Thongprayoon C. Association between psoriasis and chronic obstructive pulmonary disease: A systematic review and meta-analysis. J Dermatolog Treat; 2015. p. 1-6. [Epub ahead of print]. Maradit-Kremers H, Nicola PJ, Crowson CS, Ballman KV, Gabriel SE. Cardiovascular death in rheumatoid arthritis: A population-based study. Arthritis Rheum 2005;52:722-32. Ungprasert P, Charoenpong P, Ratanasrimetha P, Thongprayoon C, Cheungpasitporn W, Suksaranjit P. Risk of coronary artery disease in patients with systemic sclerosis: A systematic review and meta-analysis. Clin Rheumatol 2014;33:1099-104. Ungprasert P, Suksaranjit P, Spanuchart I, Leeaphorn N, Permpalung N. Risk of coronary artery disease in patients with idiopathic inflammatory myopathies: A systematic review and meta-analysis of observational studies. Semin Arthritis Rheum 2014;44:63-7. Rugbjerg K, Friis S, Ritz B, Schernhammer ES, Korbo L, Olsen JH. Autoimmune disease and risk for Parkinson disease: A population-based case-control study. Neurology 2009;73:1462-8. 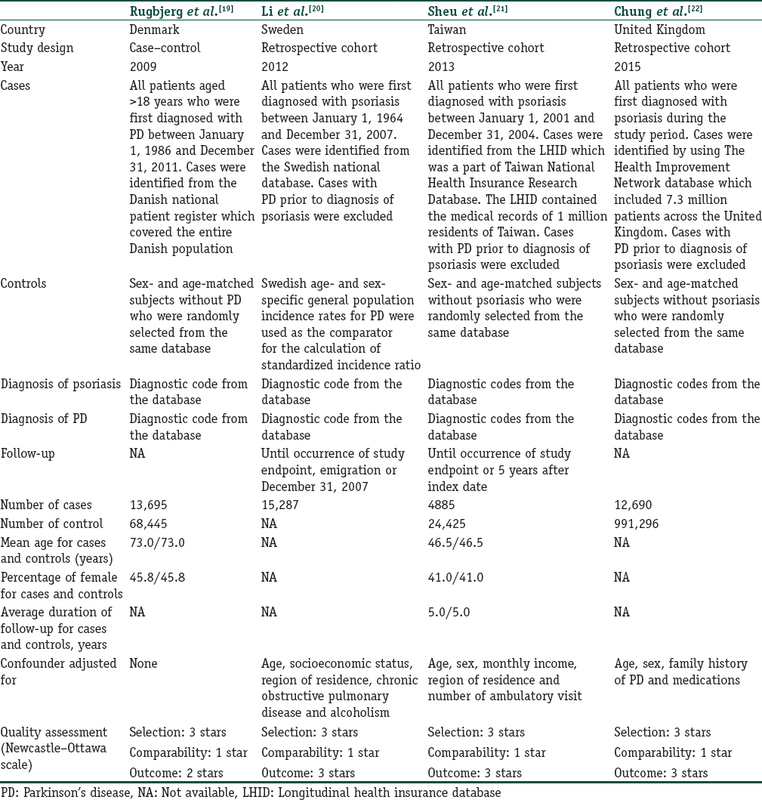 Li X, Sundquist J, Sundquist K. Subsequent risks of Parkinson disease in patients with autoimmune and related disorders: A nationwide epidemiological study from Sweden. Neurodegener Dis 2012;10:277-84. Sheu JJ, Wang KH, Lin HC, Huang CC. Psoriasis is associated with an increased risk of parkinsonism: A population-based 5-year follow-up study. J Am Acad Dermatol 2013;68:992-9. Chung J, Takeshita J, Shin DB, Haynes K, Arnold SE, Gelfand J. The Risk of Parkinson's Disease in Patients with Psoriasis: A Population-based Cohort Study. Presented at the Annual Meeting of the Society for Investigative Dermatology, Atlanta, GA; 6-9 May, 2015. Hu G, Jousilahti P, Nissinen A, Antikainen R, Kivipelto M, Tuomilehto J. Body mass index and the risk of Parkinson disease. Neurology 2006;67:1955-9. Correia B, Torres T. Obesity: A key component of psoriasis. Acta Biomed 2015;86:121-9. Armstrong AW, Harskamp CT, Armstrong EJ. The association between psoriasis and obesity: A systematic review and meta-analysis of observational studies. Nutr Diabetes 2012;2:e54. Ettehadi P, Greaves MW, Wallach D, Aderka D, Camp RD. Elevated tumour necrosis factor-alpha (TNF-alpha) biological activity in psoriatic skin lesions. Clin Exp Immunol 1994;96:146-51. Hunot S, Dugas N, Faucheux B, Hartmann A, Tardieu M, Debré P, et al. FcepsilonRII/CD23 is expressed in Parkinson's disease and induces, in vitro, production of nitric oxide and tumor necrosis factor-alpha in glial cells. J Neurosci 1999;19:3440-7. Lawson LJ, Perry VH, Dri P, Gordon S. Heterogeneity in the distribution and morphology of microglia in the normal adult mouse brain. Neuroscience 1990;39:151-70. Cicchetti F, Brownell AL, Williams K, Chen YI, Livni E, Isacson O. Neuroinflammation of the nigrostriatal pathway during progressive 6-OHDA dopamine degeneration in rats monitored by immunohistochemistry and PET imaging. Eur J Neurosci 2002;15:991-8. Gagne JJ, Power MC. Anti-inflammatory drugs and risk of Parkinson disease: A meta-analysis. Neurology 2010;74:995-1002. Patients with psoriasis are at a higher risk of Parkinson's disease with 38% excess risk compared with subjects without psoriasis.